Join us for tours and refreshments at the Art Gallery of Mississauga, Blackwood Gallery, Living Arts Centre Laidlaw Hall Gallery, Gallery Streetsville, Art Gallery of Peel, Whitney Gallery, and Visual Arts Mississauga. 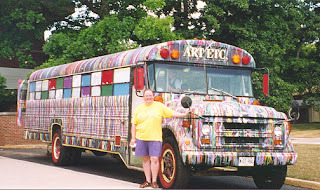 FREE Visual Art Bus Trip Mississauga and Peel region galleries celebrate the visual artists with the third Art Gallery Hop on Sunday October 21 from 11:00 am - 4:00pm. A FREE shuttle will take visitors on a regional tour of the visual art centres and spaces. For more information or to book a seat on the bus please contact Suzanne Carte-Blanchenot at 905-896-5507 or suzanne.carte-blanchenot@mississauga.ca The Art Gallery of Mississauga and Blackwood Gallery would like to acknowledge the generous support of the Ontario Trillium Foundation.